At the ripe old age of 30 Se Ri Pak will be inducted to the World Golf Hall of Fame on Monday in Florida. Her credentials are pretty damn good she's won five majors, two of them during a rookie season in 1998 that gave women's golf quite a boost. She picked up her 24th career victory this year at the Jamie Farr Owens Corning Classic. She will be the youngest player to be inducted to the World Golf Hall of Fame. 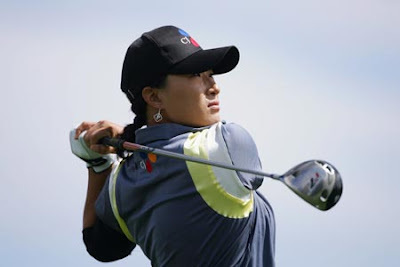 She is looked at as a pioneer of women's golf and is a golfer other players look up too and not only the Korean golfers. Good for her and all she has accomplished so far in her career. Pak will be inducted along with two-time U.S. Open champion Curtis Strange, U.S. Open and U.S. PGA champion Hubert Green, former British Open champion Kel Nagle of Australia, and three-time British Amateur champion Joe Carr of Ireland. Her legacy, however, will be as a pioneer who inspired a nation.